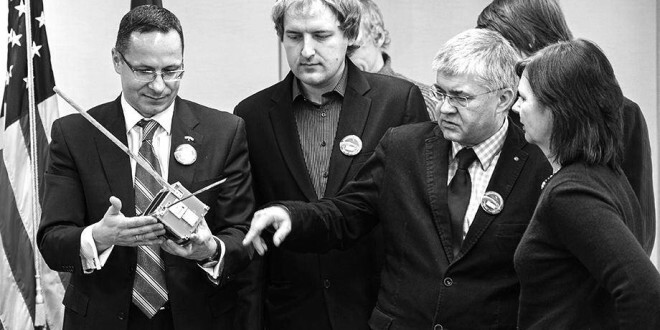 Ambassador Žygimantas Pavilionis inspects Lithuania’s first nano-satellite that went into orbit in 2014. Dr. Stasys Bačkaitis: Your excellency, on behalf of my fellow Lithuanian-Americans, I would like to express our gratitude for the outstanding representation of Lithuania’s interests over the course your term as Ambassador, especially during this time of political turmoil. Please share something about your background and why you chose to enter the diplomatic service. Žygimantas Pavilionis: I was born in Vilnius, a city of amazing beauty and history. I was a student at Vilnius University when Soviet tanks rolled into Vilnius on January 13, 1991. This experience convinced me that I had to do everything I could to help Lithuania return to Europe and escape this brute, pointless slavery. At the university, together with the young members of the Christian Democratic Party, I organized the first discussions on Lithuania’s possible integration into Europe. As a result, I was the first diplomat assigned to the European Integration Department of the Foreign Affairs Ministry (which will turn 20 this year on July 3) and worked there until I had the honor of coordinating negotiations in Brussels and witnessing Lithuania’s entry into the European Union with the signing of the treaty in Copenhagen in December 2002. In 2003 I was invited to the Lithuanian Symposium on Arts and Sciences in Chicago to share my experiences. I recall that you, Dr. Bačkaitis, helped organize that event. That was when I fell in love with America.I was surprised because I really didn’tthink that the US would become such an important force in my life. Here I found values similar to those of Lithuania, an ability to look deeper, wider, and strategically but also to effectively change the world with actions, not mere words. That is sometimes missing in Europe. I chose to become a diplomat, because I realized that I had very little time to make the world a better place. I needed a niche which would allow me to turn my ideals into a reality as quickly as possible. I was sent to Washington, I believe, because I wasn’t afraid to speak the truth. The United States Assistant Secretary of State Victoria Nuland called me the “conscience of Washington’s diplomatic corps.” I think my unrelenting stance has opened many doors for me. What were your hopes coming to the U.S.? What were your first impressions? I didn’t have great hopes. When I came to the U.S. in 2010, this country’s ruling elite looked at Russia through the Romantic prism of “reset” politics. The potentially dire consequences of this naiveté worried and saddened me. Historically speaking, the United States is the birthplace of freedom and democracy, however, these values weren’t all that apparent in this context when I came to Washington. Also, Lithuania’s economic ties with the U.S. were only modest and our human ties to the U.S, were also weakening—Lithuania was paying more and more attention to Europe, while the U.S. was distancing away from it. Happily, after five years the outlook is radically different: love for Russia has died down. (Finally everyone understood what we had been talking about!) The U.S. became the most important force challenging Russian aggression in Ukraine. (Though, I believe that the U.S. could still do more by matching its economic sanctions with military assistance). The U.S. and NATO not only have clear defense plans but also have troops and tanks stationed in the Baltic countries (although there could more of those too—at least a battalion per Baltic nation). The U.S. is now one of our mostimportant partners in confronting challenges of energy efficiency. American companies have become the biggest employers in Lithuania (relative to the foreign investments of other countries). During my tenure, the Lithuanian-American Business Council was founded in Washington. Lithuanian businesses are now more aggressively promoted in U.S. markets. (This will be helped by Lithuanian meat imports, which were negotiated during my term as ambassador, and also, we hope, by a soon to be ratified E.U.-U.S. free trade agreement). Not only has the International Republican Institute been established in Lithuania but branches of the National Democratic Institute, Freedom House, Reagan House, and Knights of Columbus have all been introduced to Lithuania. We’ve created the first cooperative agreements with five U.S. ports, and a number of universities. The first general consulate on the West Coast just opened in Los Angeles. The ceremonies took place symbolically at the Reagan Library, thereby repaying in part Lithuania’s debt to a Great President, who forged our path to freedom. Was it difficult to adapt to living in this country? Honestly, it was rather easy—my family and I felt much better here than we had during my earlier service in Europe. Americans respect people’s dignity and value their identities, including all of their differences. The kids integrated very quickly, even though, of course, it’s still better in Lithuania. There, every rock, every tree is yours—it’s like a family that no one will ever be able to change. Speaking of my own family, I’m so grateful for my wife Lina because without her support and sacrifice, I would not have been able to do all that I have in the past five years. I learned so much from them. Lithuanian Americans retained the ideal of independent Lithuania in their hearts, the ideal for which we are continuing to fight for even today. During my term as ambassador, I’ve tried to foster this ideal in the hearts of Lithuanians, and I think I succeeded, at least in part. Adjusting to work in the diplomatic corps was also pretty simple—Americans don’t set any work boundaries—if you have an idea, you run with it and inspire others to do the same. I finished my doctoral dissertation in Washington and I also achieved a black belt in Tae Kwon Do. If you want to win in Washington, you have to be ready for a fight. During your term, we observed that U.S. government, Congress, and a variety of other political and social bodies began paying greater attention to Lithuania and the other Baltic nations. Lithuania has become a part of American politics and America a part of Lithuania’s more than ever before. How did you succeed in getting the attention of American politicians and piquing their interest in Lithuania’s issues? From the very beginning, I looked for things which would connect us. I started with values. After a few Democratic Community events in Congress, Americans understood that we’re not fighting for “our” values and interests but for “general” values and interests.I always tried to maintain a balance between values and interests. Besides that, we were able to establish both to American politicians and to business leaders that our experience and abilities could be of benefit to them as well. Even though it sounds arrogant and surprising, over the last 25 years, Lithuania has begun to bypass the U.S. in some sectors. From the time of Sąjūdis, the U.S. has viewed the rebuilding of Lithuania as one of the most successful transitions to democracy in history. Could you describe how people in Washington, DC view Lithuania? Washington respects our country’s successful transformation, which in turn inspired other countries around us. But in an effort to maintain that respect, we have to have a clear strategy for at least the next 25 years and to always think about the future and not to wait for our partners in the U.S. to ask us to increase our defense spending—we have learn to take care of ourselves and become part of the solution, not part of the problem. Have your duties and priorities as ambassador changed since Russia’s aggression in Georgia and Ukraine? Ambassador Žygimantas Pavilionis with his wife Lina in Mexico. three letters – KGB. That is why we really weren’t “surprised” when Putin sent tanks into Georgia and Ukraine. We warned our partners about this from the very beginning, but no one wanted to listen to us. Now they’ve heard us, although not everyone. You periodically criticize the West’s passivity in dealing with Russia’s aggression. Having had experience on the other side of the Atlantic, can you name some changes in Russian-Western and Russian-European relations? I think that Russia has remained one of the most important problems in Western politics—everyone now understands that being nice to Russia won’t help—we have a case of an aggressive, KGB-led, extremely corrupt country. The recipe is simple (it was discovered by the Americans’ beloved President Reagan)—it’s called “containment” politics. We still have time to stop Putin, and we have enough resources to do so, but if we continue to delay, if we keep trying to “bargain” with him and to dance a meaningless waltz of peace, we will quickly realize that we have been dancing alone. And while we’re dancing, we will continue to be looted, tricked, and occupied. By the way, that’s exactly why President Reagan had such good personal relations with Gorbachev—he understood that the KGB respects strength, not weakness, which Moscow provokes with its new conquests. What do you see as your biggest and most important successes in your term as ambassador? The U.S. military presence in Lithuania, the revitalized politics on all levels of the U.S. government (president, secretaries, Congress) using strategic cooperation, the large-scale entrenchment of U.S. business in Lithuania, the beginning of the exportation of LNG, the agreement that allows Lithuania to export meat, the opening of the general consulate on the West Coast, and, of course, human ties— stronger ties with the Lithuanian community and a number of influential American NGOs setting up local offices in Lithuania. Did you experience any disappointments or difficult moments? I have to experience them everyday, but I got used to looking at life as a constant fight from which I cannot retreat—I have to finish the work I started. That’s one of the most important principles of Tae Kwon Do, and it’s one of my favorites. It’s important to know what you’re reaching for, not to lose your balance, and to always move forward. It’s important that the fight doesn’t become an end in itself—every action has to have a meaning and a purpose. The purpose of my fight is to make the world better, to bring harmony and human dignity into it as much as possible, and to strengthen Lithuania and its people. Not long ago, the American news revealed that the Russians had electronically infiltrated the White House and the State Department’s communication channels. Have you experienced Russian attempts to break into Lithuania’s embassy’s communication system or affect the embassy’s work in other ways? I can’t reveal any details, but if the Baltic countries, as well as other nations, institutions, or even specific people, are fighting against Putin’s tyranny, they are under greater scrutiny. We as a country have to do more to protect other countries, but, unfortunately, we often don’t understand or feel connected to the games those countries play. I was in Chicago not long ago, and I couldn’t help wondering how one Lithuanian American newspaper that is published by a Russian company had become so popular. I also won’t forget events in Lemont, IL, where some people, who until now had been delivering the essential message of Russia’s propaganda, were now actively working with the previously mentioned Russian newspaper’s journalists. So not just Washington but Chicago, not just the embassy but Lithuanian-Americans, I think, are under increased KGB scrutiny because they are our valuable, political backbone in the U.S., which someone wants to break and use for their own purposes. You mentioned in an interview that five Russians, three of whom understand Lithuanian, listen solely to the conversations of Lithuanians in Washington. In your opinion, what functions do they fulfill—to neutralize the Lithuanian embassy’s influence in different levels of the U.S. government or to change the public opinion of émigrés? I think that the KGB’s most important goal is to lessen the U.S.’s influence in Europe as much as possible because the less of the U.S. there is, the more of Russia there can be. They’re doing everything they can to destroy a variety of projects that would link the U.S., Europe, and Lithuania—the KGB is working against NATO and EU enlargements, U.S. military presence in Lithuania, U.S. military assistance to Ukraine, stricter economic sanctions, and our energetic defense projects. I’m sure you’ll remember how many forces were used against our oil and later against our LNG terminal and our nuclear project and our shale exploration. Now there’s a new KGB initiative against our EU-U.S. free trade agreement (Transatlantic Trade and Investment Partnership). They’re trying to pit us against the Polish and Jewish communities. Although the KGB disguises itself well, when you’ve watched Russian activity for a long time, you begin to see common players and common schemes that they use. The KGB does everything it can to keep us from thinking or concentrating, to make us forget or fall asleep—and they were able to reach many people in this way. Even now, the West doesn’t have a clear strategy about what to do with the dangerous KGB regime in Russia and where to draw the final line. Up until now, the West has been very accommodating to Putin’s politics, and that’s one of the biggest historical mistakes that both the U.S. and Western European countries are making right now. You see, as always, all the alternatives will be gone before we realize that we will have to pay a bigger price. I hope that this policy will change at least in 2016 if it’s not too late already. The Lithuanian embassy has very effectively smoothed over the bad image of Lithuania in the U.S.’s Lithuanian Jewish community. How did you succeed in overcoming this long-held Lithuanian-Jewish reproach for Lithuanians? I’ve always considered the Lithuanian Jews as a part of our identity, and I worked to restore the harmony between us that existed beginning with the 13th Century.If we seek differences, blame each other, and look at each other narrowly, Putin and company will deal with us very quickly. We have to learn to look wider and more strategically, like our grand dukes did when they acquired new lands. We have to learn to coexist not only with the Lithuanian Jews but with the Poles and with other countries in the region that are fighting against the KGB. For 50 years already, The Lithuanian American Council through The Joint Baltic American National Committee (JBANC) has coordinated and successfully helped form U.S. policy towards the Baltic countries. How do assess this organization’s activity, direction, and usefulness? Do you have any suggestions about how to revitalize and coordinate the Baltic countries émigrés’ political goals? For the past five years, I have worked very closely with JBANC—I was on the front lines whenever they had to deal with the most difficult issues. JBANC works perfectly because it coordinates its own activity with that of other formerly enslaved émigré communities in the U.S. When we combine our efforts in Washington, we are an extraordinary power. We have to continue to unite both our diplomatic and our community efforts in Washington. For example, when you visit Washington for whatever reason, make sure to couple your visit with a demonstration: stand with Lithuanian flags somewhere near the White House, along with Ukrainians, Poles, Latvians, and Estonians, to demand a stronger NATO wall in the East and the building of a U.S. military base in every Baltic state as well as the distribution of military aid to Ukraine. During your term as ambassador, the network of honorary Lithuanian consulates has grown significantly. Does this growth meet Lithuania’s expectations? How do they help Lithuania? Of course it meets expectations,though that’s not enough.I’d like to see an official Lithuanian honorary consulate flag in every American state because our—the country’s officials’—efforts and resources will never be enough for this, the biggest economy in the world and one of our most important allies. During my term, in addition to the previously mentioned historic opening of a general consulate on the West coast, we opened six new honorary consulates (there are 24 in total), but there are still many states where the Lithuanian flag doesn’t fly. Every state in the U.S., based on size and often on economic or political importance, is equivalent to a country in Europe, where we do have working embassies. Combining all of our working embassies in Europe together and comparing that to the human resources in the U.S. (and the importance of the work in the U.S.), unfortunately, we clearly lose. As a country, Lithuania doesn’t invest enough in the U.S., and we are forced to ask private U.S. citizens to help make Lithuania’s name known and increase its influence. 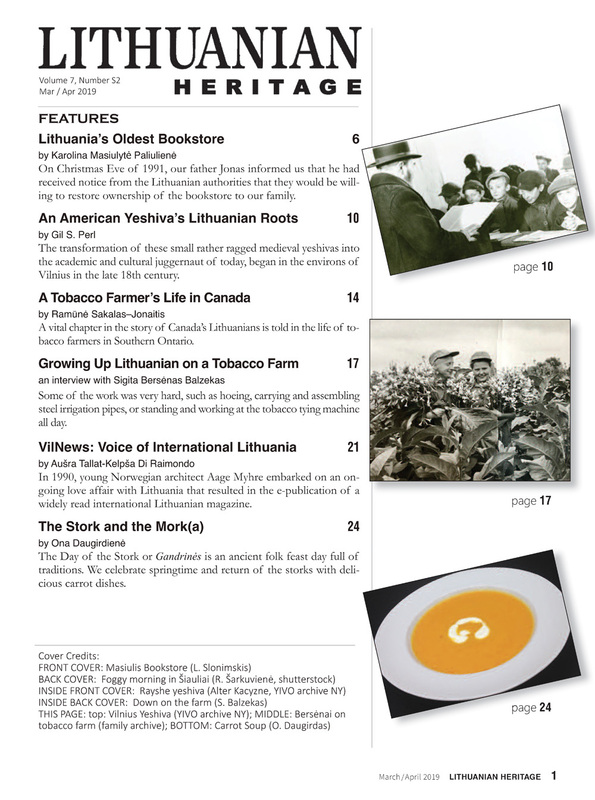 How do you assess Lithuanian-Americans’ ties with Lithuania? What surprises you the most? Have your views about Lithuanian émigrés and their problems changed? In the U.S. I met with émigrés almost every day, I really gained a lot. To be honest, I discovered within them the interwar heritage that had been saved and then enriched by the extraordinary heritage of a community of American citizens. Our goal is not just to save the Lithuanian identity in the U.S. but also to protect Lithuania itself. Let us learn from the Lithuanian Jews, who are doing everything they can so that Israel not only survives but also becomes the strongest nation in that region. Over the past 30 years, Lithuanian-American Catholic parishes have been disappearing very quickly. 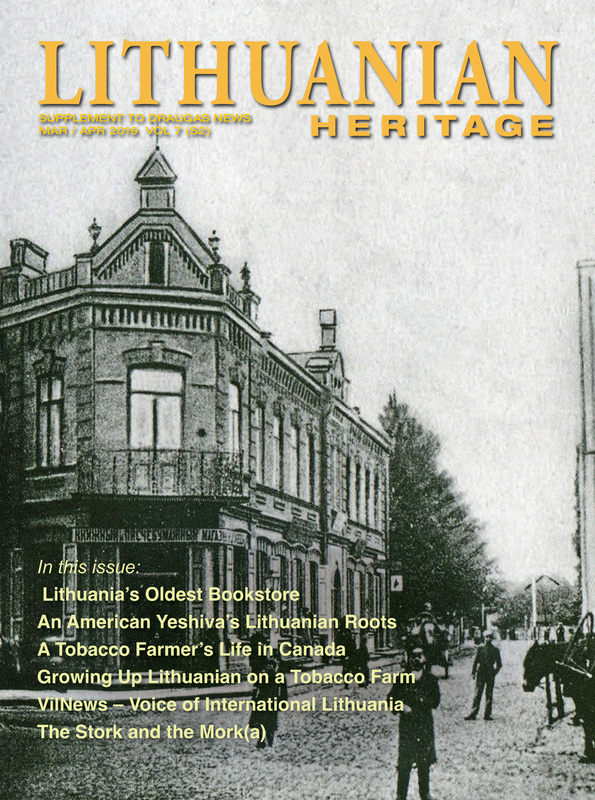 This often prevents people of Lithuanian heritage from meeting for community activities, which were supported by and continue to be supported by the parish’s vitality. Do see any silver linings here? There are several generations of Lithuanian émigrés in the U.S. What, in your opinion, are their similarities and differences? Can you suggest a way in which they could better concentrate on achieving the goal of Lithuanian survival? How could Lithuania add to the achievement of their goals? We will only survive if we work together, and stand united. A branch broken off a vine will dry up quickly. If we separate into our comfortable little cliques, seek success only in our careers, belittle other Lithuanians, criticize and laugh at Lithuania, we won’t survive. Ambassador Žygimantas Pavilionis with Ukrainian brothers at the Lithuanian Embassy open house this May. 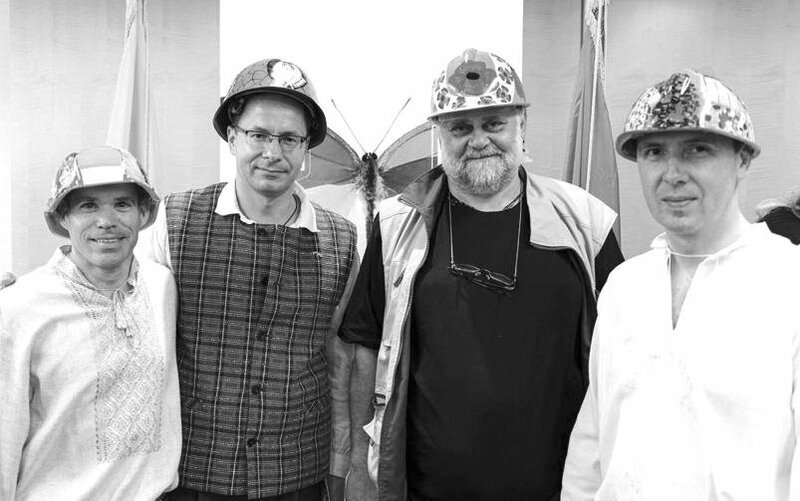 From left: Director of the Ukrainian National Information Service Michael Sawkiw, the Ambassador, Sąjūdis member Artūras Skučas and First Secretary of the Ukrainian Embassy Yurry Tyrkus. Or if we do, we will no longer be ourselves. Our Lithuanian identity is our calling, our mission. If we give up, we will lose our place in the world, our direction, our calling. Of course, we all have our individual goals, but we always need to coordinate them with those of our families, and we make sacrifices for our families—and Lithuania is just a larger family, all of our families’ family, without which we would be alone. At the end of our lives, we would realize that we had lived just for ourselves and had not given anything up for our neighbors, for our real family. One day, we will be gone, and we won’t take our careers and riches with us into the next world. All that will be left is what we gave to others. That’s why, while it’s still not too late, we should listen to President Kennedy: “Ask not what your country can do for you, but what you can do for your country.” Then there will be meaning in our lives, and we will be able to say that we didn’t live in vain, that we did not just live for ourselves. Obviously, that doesn’t mean that we shouldn’t worry about our family, other nations, or the rest of the world. But if we just do that, and we forget our real family, Lithuania, then we’re insincere, inconsistent, and self-deceiving—if you are unable to help your neighbor, then, in reality, you can’t help yourself or a stranger. Besides that, “big” deeds are always done more easily than “small” ones. A hero’s real value is expressed in everyday life. What is your view about dual citizenship for Lithuanians living abroad? 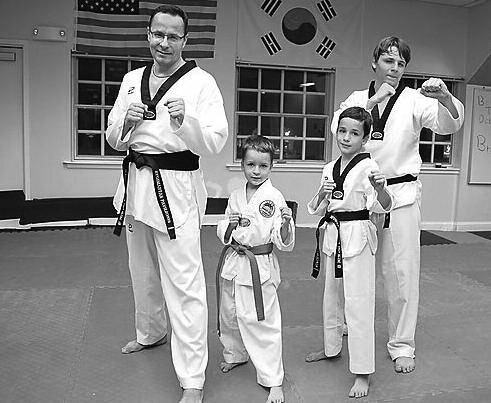 Black belt Ambassador Žygimantas Pavilionis with his sons Vincentas, Simonas, and Dominykas. ought to be more active in Lithuania regarding this question. The best American Lithuanians, the ones who are responsible people in authority (not the populists), ought to go to Lithuania and talk about this issue. They should try to find a consensus. In addition, you should invite Lithuanian politicians to visit you regularly and to establish branch offices of various Lithuanian political parties here, so that they could hear you, understand and appreciate you. American Lithuanians ought to participate in elections much more actively than they have done in the past. The current number of voters in the United States (a few thousand) hardly reflects the real number and strength of Lithuanians in the United States. In these technological times, communication over large distances has become a lot easier, but the emotional distance between those in Lithuania and those living outside its borders has not necessarily diminished. In your opinion, what measures could help close this emotional gap? Much greater investment in Lithuania in the dignity of man. During the last 25 years we have still not learned how to appreciate the human individual in Lithuania, even though many American companies are currently establishing themselves in Lithuania precisely because of the inner strength, high level of educational training and industriousness of our people. If the Americans value this potential, why is it that we do not value it ourselves? Politics in Lithuania should focus not only on a strong country, but also on the strength of the individual, without whom a strong country cannot exist. We have to understand that not only the quantitative but also the qualitative side of democracy is very important. Then we will be able to communicate better with the Lithuanians in America. Lithuanian politicians often talk about the necessity to entice emigres back home. Is this realistic? It is realistic, if we create and finance external mechanisms and programs, and if we start to appreciate every Lithuanian, every Lithuanian citizen, every human being. Our economy is rising faster than that of many of the countries where some of our countrymen have established themselves. That is why they are returning to Lithuania much faster than before. I think that soon more will be returning than leaving; however, we will overcome this ‘deficit’ ultimately when people who were born or were trained under freedom and who respect human dignity, return to politics. That is the foundation of freedom. When the human being comes to be considered the greatest treasure in the eyes of Lithuanians themselves, not only in the eyes of foreigners, then the majority of Lithuanians will return, because I can say with conviction after having served for 23 years as a diplomat, that there is no more beautiful or dear a country than Lithuania, and those who think otherwise are fooling themselves. What new possibilities does the worldwide migration of Lithuania’s citizens open up for the nation and the country? Is that beneficial to Lithuania? Of course, Lithuanians are very adaptable. We are very talented, we are Lithuania’s greatest treasure, but that treasure achieves its meaning and its worth when it returns to Lithuania, when it reinvests the experience it has amassed abroad. If a Lithuanian abroad invests in himself as his ultimate goal, then eventually he becomes a non-Lithuanian. According to sociological questionnaires, only 5% of Lithuanians living abroad retain their Lithuanian identity to the third generation; in other words, only 5% of the grandchildren of those who leave Lithuania now will speak Lithuanian.I often ask America’s Lithuanians: why should you lose your Lithuanian identity, if at present the United States and Lithuania are coming so close together not only militarily, but also politically and economically? Maintain your Lithuanian identity and you will become more successful than a lot of Americans. You will have a natural bridge to Europe, which is becoming a common trans-Atlantic family more and more. However, this success will work only if you are able to maintain ties with Lithuania. Without those ties, you will become estranged from yourself, from Lithuania and from the United States, because in your hearts you will still remain Lithuanian. Ambassador Žygimantas Pavilionis demonstrating for Ukraine. Your industriousness, your desire to cover a huge sphere of activity, is amazing. If you ever get any free time, how do you and your family take advantage of it? I don’t have much free time in the United States, because Lithuanians (and others as well) meet on weekends and they invite me everywhere. I think that I will have more time to devote to my family in Lithuania.Being in Lithuania is being with your own people, and this naturally gives you more time to spend with those who are close to you. I miss my friends in Lithuania, I miss my Vilnius, my country village, the grass I call my own. When you live in Lithuania, you often do not realize how dear everything is to you. You only understand this when you go to another part of the world, where it is harder to find a corner to call your own. What are your immediate plans and hopes upon returning to Lithuania? Maybe it is too early to ask, but here in the immigrant community your name is often brought up as the best and fittest candidate for the presidency. Is that something on your horizon? Thank you very much for the compliment, but I am not thinking about such long range possibilities now. In the immediate future (2015-2016) I will have to get established in Lithuania, and I will have to reinforce our Eastern front politically and diplomatically. I also intend to join the National Guard (‘Šaulių sąjunga’) in July, when I return to Lithuania. If we are able to hold back Putin in the near future, then qualitatively different possibilities will open up for Lithuania and for all of us. The time for us to assume a leadership role will come. American-Lithuanians are very grateful to you for the attention and concern you have shown in seeking to maintain Lithuanian culture and in promulgating familiarity and understanding of Lithuania here in the United States. 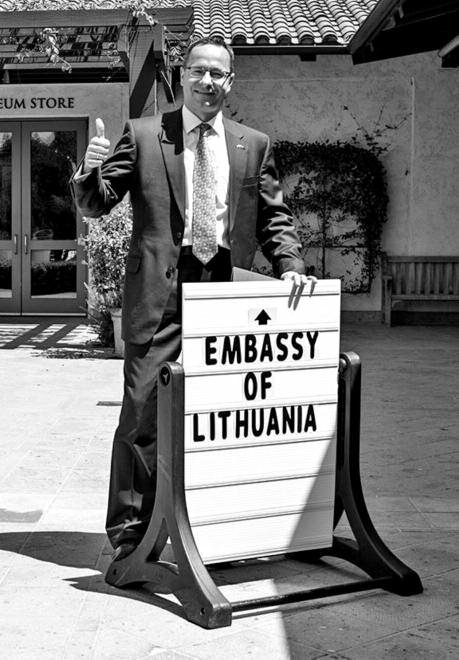 During your term of office, you have opened wide the doors of the Lithuanian embassy to American-Lithuanians and you have visited many of the locations where Lithuanians have settled. In this way you have encouraged us to have a more sincere and meaningful interaction with each other. You have left an indelible mark on the history of Lithuanians in America. I thank you very much. I like wise thank all of those whom I have met in America during the last five years. I have learned a lot from you, and I will do everything I can to make use of all that I have received from you in the best possible way in Lithuania. And if you get any new ideas, please send them to me at Twitter @ZygisPavilionis or to my Facebook page Zygimantas Pavilionis. I will also post my most important activities on my personal website www.zygispavilionis.lt. Let us keep in touch! Translated by Gabrielle Gedo and Rimas Černius. Stasys Bačkaitis, PhD, represents the Lithuanian American Council in JBANC and the Central and Eastern European Coalition in Washington, DC. 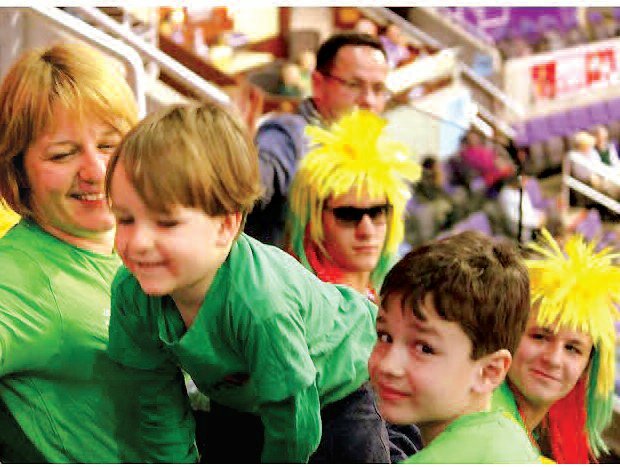 Pavilionis family members cheering Lithuanian basketball players.